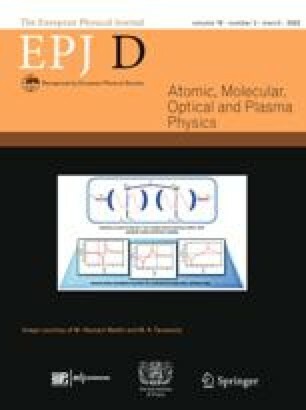 Electron ionization (EI) and dissociative ionization (DI) of Iron pentacarbonyl molecule (Fe(CO)5) was studied using a crossed molecular and electron beam mass spectrometry technique. Positive ions FeO(CO)+, FeC(CO)2+ and CO+ of Fe(CO)5 were detected for the first time. We have determined the experimental appearance energies of positive ions, the thresholds for dissociative reactions, the experimental bond dissociation energies for (CO) n Fe+-CO bond breaks (for n = 4,..., 0) and their average value for Fe-C bond energy 1.25 eV in Fe(CO) 5 + . We have performed extensive density functional theory (DFT) studies of the ground states of neutral molecule and fragments 1A′1 Fe(CO)5, 3B1 Fe(CO)4, 3A1 Fe(CO)3, 3∑g Fe(CO)2, 3 ∑FeCO as well as positive ions 2A1 Fe(CO) 5 + , 4A1 Fe(CO) 4 + , 4A1 Fe(CO) 3 + , 4∑ g Fe(CO) 2 + and 4∑ FeCO+. The structures and energies of the states have beendetermined and the calculated bond dissociation energies (BDEs) were compared with present experiments as well as with previous works. Contribution to the Topical Issue “Elementary Processes with Atoms and Molecules in Isolated and Aggregated States” edited by Friedrich Aumayr, Bratislav Marinkovic, Štefan Matejčík, John Tanis and Kurt H. Becker.